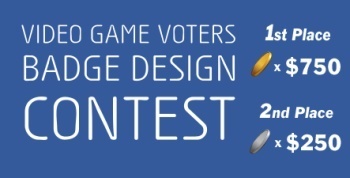 The Video Game Voters Network is holding a "Badge Design Contest" with a $750 Best Buy gift certificate up for grabs. If you've got an artistic bent and a Best Buy within reasonable driving distance, this is your big chance to put them both to good use. The VGVN has made its declaration: "The future of videogames is at stake, and we need your help!" And that help, apparently, needs to be in the form of a new badge. The rules are simple. Badge designs should incorporate the name "Video Game Voters Network," the acronym "VGVN" and/or the address www.vgvn.org. The contest runs until August 23 and designers can submit as many entries as they like, in .GIF, .JPG or .PNG format, no larger than three megabytes. Once the contest period ends, a panel of judges will select the top ten designs, which will then be put to the public for a vote. The winner will get a $750 Best Buy gift certificate while the runner-up takes home a GC worth $250. The Video Game Voters Network is an advocacy group for gamers that works to protect the First Amendment rights of videogames, a common target for politicians and others who fire sensational, baseless criticism at the medium and sometimes even attempt to impose unconstitutional restrictions against them. With California's appeal of its overturned videogame law coming before the Supreme Court in the near future, the VGVN is working to raise awareness and get the word out about the importance of the issue. Supporting a good cause, showing off your creative talents to the world and maybe taking home some free loot from Best Buy in the process? Sounds like a win to me. Take a look at the full contest rules, or just make something up and send it in, at videogamevoters.org.